Grades 8–12. If you&apos;re on a tight budget, here&apos;s a clear solution. 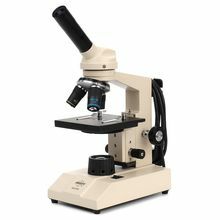 These full-size educational microscopes are built to withstand student use and abuse, with locked-on eyepieces, objectives, and stage clips, plus a slip-clutch system to protect gears from over-focusing. The LED models (items #595504 and #595507) are particularly useful for viewing living specimens due to the cool lighting system.